Gucci "Sylvie" loafer in GG supreme velvet. Curb-chain detail at notched vamp. 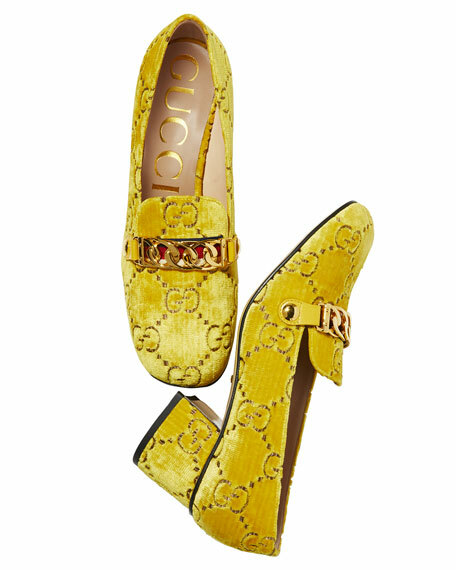 Gucci leather and lace loafer mule. 0.3" flat heel. Round toe. Bit-strap at vamp. Smooth outsole. Slide-on style. Made in Italy. Gucci "Marmont" metallic leather city sandal. 3" covered block heel. Scalloped strap with logo bands open toe. Thin adjustable ankle strap. Padded footbed. Leather sole. Made in Italy. Gucci "Houdan" tricolor leather loafers with horsebit hardware. 3.3" covered block heel with 1" platform; 2.3" equiv. Round toe. Notched vamp. Slip-on style. Leather lining and sole. Made in Italy.